This weekend, instead of using my “off” morning time to work on my novel, I decided to immerse myself in a half-day motherhood retreat. Not a retreat from motherhood, but a retreat to motherhood. Better motherhood. For some time — years — I’ve been moving closer to fitting all the pieces together. This process has been a conscious journey. If you’ve been reading these pages for a while, you may remember my struggles with living in the moment as a working mother with 5 kids and too many hats. There’s the vortex of caring for young children, our trouble with transitions, accepting that someday is today, problems with multi-tasking, and my recent love affair with fixed-schedule time management. I do have the occasional flash of successful mothering. But the sum total is a lot of focus on what I’m not doing, and angst about what it all means. My frustration stemmed from feeling like when I’m doing my own creative thing I’m not being a mother, and when I’m being a mother I’m not really doing my own creative thing. Putting stakes down around my creative time often comes with a price. Yet I know that being actively creative raises my resistance to domestic disasters. I know that “blending” the two parts as much as possible is often the key to success, but there are limits to how much you can pursue your art without some amount of time and space “apart.” Aren’t there? A dear friend of mine is emerging from a potentially life-threatening illness — during which she resigned to stop living under the shroud of obligations. “No more ‘shoulds,'” she told me. She decided that living her life in terms of what she should or shouldn’t do hadn’t served her very well, and big changes were in store. I thought about this a lot. I realized that it makes sense on so many levels. Even practical terms. I decided that I too wanted to live in the realm of “want to” and “have to” only. Those are the things that matter. I might tell myself at 5:00 that I “should” start dinner, but put it off until 5:45 when I really have to start dinner. Why muck everything up with the “shoulds”? Either you want to start dinner and you do, or you have to start dinner and you do. Either way, dinner gets cooked, and you don’t need to fret about it one way or the other. No more relationships that I “should” foster. If I don’t want to invest myself in someone, then I won’t. Why throw myself away like that, in the name of “should”? What’s most interesting about this particular exercise is that when you remove the “should” factor, you realize that there is a lot more “want” than you thought there was. When I thought about pulling away from certain friendships, I realized that I really didn’t want to do that. Some of those relationships were actually not based on obligation as much as I thought they were. When I remove the cloud of “should,” suddenly everything is clear. There is commitment because it’s actually important to me. So all of a sudden nurturing those relationships feels like a gift, not a chore, because I’ve recognized their true value. Strangely, I’ve finally figured out how broken my framework was, and the many ways in which I perpetuated that broken viewpoint. I used to think it was cliché to say “my kids come first.” Like, duh. None of us are going to let the kids burn up in a fire while we run to the studio to save the canvases. But with my new paradigm, I see beyond the cliché. It’s the kids. Creativity is important, but I can’t live my life thinking that my children are the barrier to my creativity, and I can’t live my life trying to come up with clever ways to convince myself that that isn’t the case. Because really, it isn’t the case. It turns out that I’ve totally missed the forest for the trees. You’ll have to bear with my slowness on some of this stuff. I’ve spent my entire adult life being a mother and some of my perspective was apparently truncated along with my youth. I was 21 when my first child is born — he’s a freshman in college now. Since there is a very wide age span between my children — the youngest is not yet 2 — I’m still in the trenches of parenting young children. Creativity is a beautiful overlay to my existence, but not the reason for my existence. Motherhood isn’t the reason for my existence either. The point is just to be here and take it all in. Just be here. Breathing and enjoying and letting the magic happen instead of using a shoehorn to make it all “work.” But meanwhile, while I’m living in the moment, serving the people I love is surely the most important way to focus my time. By “serve” I don’t just mean feed, bathe, clothe, and chauffeur — although of course, those are parts of it — by serve I mean serve bring joy, bring peace, bring laughter. My job is to help everyone I live with wake up and feel excited to be alive. I am not responsible for their happiness in the largest sense, but my job is to help them along the path to self-actualization as much as possible. And that’s a job I really want. The “job” of nurturing my family is certainly more meaningful than the one I get paid for, even though you wouldn’t know that based on how I’ve let my business consume my life like over-fertilized kudzu. Over and over again I let my professional work take precedence over everything else, and then come out on the other side thinking that I won’t let it happen again — only to crawl back under the same rock a few weeks or months later. It’s taken nearly 15 years, but I’ve finally figured out why I keep getting overbooked. Last month I sat down and did a bunch of math to calculate my monthly quota, how much time I need to spend on my retainer clients, and how much time I need to spend on additional billables. This all sounds so obvious, but I had never figured it all out before, and as a result was double and triple booking my time — and short-changing my most loyal clients. No more. I now know exactly how many hours I have on hand to spend on “extra” work and I am not going to say yes to anything new that won’t fit inside this box. I’m just done with working day and night and ignoring my family and my creativity in the name of meeting some “important” deadline. What’s so important, exactly? OK, so the work dragon has been slayed. I get it. It’s been two weeks since I won that battle and I feel like a new person. The drop in stress level is amazing. Suddenly I have the bandwidth to focus on all of the important things — the people — I’ve been putting in the backseat for so long. I realize that I am in the midst of a tangible gear shift as I begin to live more in accordance with my priorities. It’s an incredible sensation. This may not be sufficient indication, but I horde organization-related books. There are at least a dozen excellent other titles on my shelves, but these are the ones that jumped out at me that morning. I wanted to figure out how to use my organizational resources to create a system that supported my priorities, rather than left me feeling like I had a million things to do and no time to do them. I also wanted to create a few good lists of projects and games that I can do with my 4-year-old AND my 21-month old — and figure out how to incorporate that creative time into our lives in a meaningful way. I pulled apart all of my various planning methods and organizational tools and recreated the elements into something new that actually speaks to what I believe in. Something that actually helps me live in alignment with what really matters, rather than helps me chase the dust bunnies of life. The result is a binder. A binder that includes all of the essential building blocks, all in one place. Motherhood, domestic life, the big picture, work — it’s all here, in the planner to end all planners. I think of this as my new laptop. And now, instead of staring at a piece of equipment, I can reach for PAPER — that beautiful, evocative tool that leads me to creative paths in ways that my iPhone — much as I love it — and MacBook — much as I love that too — cannot. While my new planner is fed by various applications and digital tools, it ends up being a tangible thing that I can carry and flip through throughout the day — without the distractions of e-mail and internet, which so often pull me away from what’s important. Some of our community members are already living in alignment with their priorities, and don’t seem to experience the struggles that I’ve touched on above. I applaud the strength of that inner compass, that “knowing” without having first spent years doing it all the wrong way. But if you don’t quite feel at peace with your life’s “balance,” take a few hours one evening or Sunday afternoon to think about your big-picture goals, your real mission, and hold that up against how you really live, you may find that there is a gap between the two. The next task is to figure out how to close that gap. The results are so exciting that I find myself leaping out of bed every morning because I cannot wait for the new day to begin. I feel like a new person, and I already see a remarkable difference in how my family and my relationships with my children are changing as a result. The creativity part? I’m not worried about it. I have no shortage of inspiration, and I’m confident that I will finish at least one of my various writing projects. I will write when I write. Whether I write or not, I’m going to enjoy the process. Living life in this openness actually feels more creative than when I’m forcing myself to write because I “should.” I’m no longer going to let “shoulds” take the joy out of what I love, whether that’s a creative project, my husband, my children — or myself. or something like that. meaning if you want to veg, you will veg. if you want to hug your kid, you’ll find yourself doing it. if you want to to be writing the great american novel, or anything else for that matter, you’ll find that that is what you are doing. for me i find that i used to make all these wants or needs etc conflict, but they don’t have to, they can flow when it’s appropriate for one to take the lead over another. i finally put my health before a lot else i ‘should’ be doing, until i realized i wasn’t able to do any of it until i really took care of me. yes, at the moment it’s putting me thirty steps behind on everything else, but i needed to take care of me so that i can do all the things i want to do in the near future, in the meantime, healing. Cathy, I’m not sure I agree with your friend’s assertion that we always find time for what what we want to do. (I think men have an easier time doing what they want to do, as a general rule.) I spend a LOT of time doing what I think I *should* do and doing what I *have to* do. I am now working toward living more in the want, which first requires an understanding of what “want” really is. Great to have you back, BTW! Jen and Liz, thank you for the support! Much appreciated. I’m trying not to think too much about the time that I’ve wasted, as that’s just more useless nonsense. But when I picked my son up from preschool today, he said “Mommy, why are you smiling like THIS?” and he made a cute little grinning Cheshire Cat face. I laughed. “It’s just because I’m glad to see you!” I said. And then I thought to myself….geez, a truly smiling Mommy face is so foreign to my little guy? It just goes to show that even though I always greeted my son with a smile at pickup, today I expressed genuine happiness with my smile. And my son knew the difference. Wow, it’s like I’m starting from scratch. I am absolutely reassessing EVERYTHING this weekend (this has been a long time coming, not some whim.) So much of this post made sense to me. I think it will answer some of the quandaries I have put in purgatory for so long. I am getting out my ‘have to’, ‘want to’ and ‘should’ bins as we speak. Loved this, and it is very timely for me. It’s interesting, because I learn all about losing the “shoulds”, seizing the moment and prioritizing things that truly matter through my recovery from alcoholism. For some reason, though, I have a hard time weaving these principles in to my work. I resist being ‘organized’ about my work – I prefer to embrace the notion that I’m some free-floating creative spirit. But my life is far from free-floating – it needs structure to stay afloat. I think, maybe, that because I’m tied to structure so much with two younger kids, that I resist this idea in my creative endeavors. Like my own little quiet rebellion or something. But I’m slowly realizing that without structure around my creativity I fall victim to the “shoulds” waaaay more than I need to. Thank you SO much for your insights. I learned a lot!! Thank you for this post. I struggled with all of this so much when my children were babies that I gave it up – creativity that is. Once my boys reached 10 and 13 I realized what a loss my sacrafice was in my life. For the last four years I have worked very hard to get a balance figured out! I applaud your sharing you methods. I find that a lot of what you’ve talked about above helped me a great deal too!!! It’s great to hear you sounding so positive and balanced about the new changes you’ve put in place. A really great post for a blah Wednesday afternoon. what it made me realize is that we all need some sort of balance … but that balance is absolutely different for all of us …..
off to read reviews now of that book list …. i’ve only heard of happiness project …. Oooo, I left out one of the key books: “Busy But Balanced” by Mimi Doe (it was in my bag instead of the pile as I drafted my blog post). Just added that to the list. One of my favorite resources. I’ll be following up with more thoughts on all of this, as I am positively bursting at the seams! Thanks to all of you for being a part of this vital community — I do so appreciate your presence and thought-provoking responses. great post, miranda. i’m thrilled for you that you are finding your way with this. you new plan sounds wonderful. i am totally not there yet! i also can’t agree with cathy’s friend’s assertion that we always find time for what what we want to do. i’ve been letting go a quite a few things lately (FINALLY got someone else to volunteer to take over my sorority alumnae chapter leadership! ), and i’ve been drifting away from other “obligations” that i really don’t feel obligated to anyone. drifting away from those things that are of no benefit to me. maybe that’s selfish but there’s just not enough time in the day…which is why a disagree with cathy’s friend’s assertion. i’ve said this before. I HAVE TO SLEEP! i read about other full-time working moms who also are pursuing their art and most of them doing it by staying up late after everyone else has gone to bed. i simply can’t to do that. makes me incredibly grouchy and feeling even more overwhelmed. Amen, Miranda. Thank you for this wonderful post! And bravo for making this shift happen in your life! I’m going to print this out as a reminder. i still need to give this post a thorough reading, i scanned earlier. i hope i didn’t seem trite in bringing in the idea that you find the time for what you really want. i think i was trying to get at that in this stage in my life, and for miranda, too, letting go of the shoulds, etc, has a remarkable effect on what it is you do really want to focus on. i was struck by how when miranda made the decision that it wasn’t about shoulds anymore, her son noticed a remarkable improvement in her. i can really get a lot of what miranda goes through from the blended family, feeling like a parent for whole adult life aspect. when you start over having kids again a second time, it is easy to feel like really?! i thought i just got my first kids to a place where i could have MY life back…but i have found in how difficult it was for me to have my latest edition, and what i’ve gone through since that made me slow down for my own health, there came a point, or continues to come a point where i really appreciate that i made the decision to have her, to do this parenting thing again over 40. so i have slowed down considerably, all the obligations i see coming for me from different aspects of my life, i am at a point where i say: health, family, writing, then the rest when i can, if i can, and only if i really want to. sure i want to be providing a second income either through educating or writing or whatever, but right now, there’s no room in my life for whatever. and we’re getting by, and hopefully, in a couple of months, i can return to educating or return to focussing on really getting my book out there and published. but for right now, i can sit up at my computer for about an hour a day, and even that is pushing it. so i’ll get there when i can. it’s thirty minutes more than yesterday. It took me a long time to find a system that works for me after my daughter was born, and now and then, the “should” demons still creep back in. The important thing is that I’m content with how I spend my time. I think most days I am able to find that balance between motherhood and creativity, and that makes me happy. 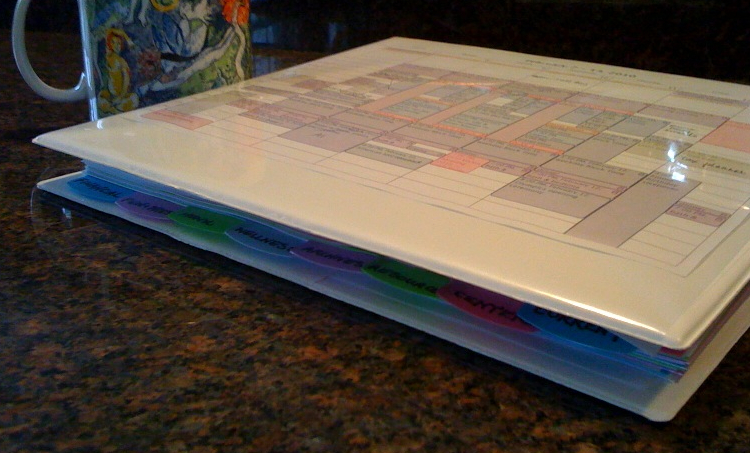 …and your binder concept speaks to my organizational soul, as I have binders for everything! You have a gift. This post could not have come to my RSS feed at a better time… I needed to read what you wrote this week; you may have saved me a lot of bother and wasted energy, and guilty resentment because I am only 4 years into motherhood and making the mistakes you mention and had a very bad day this week with my 3 and 1 year olds, cracking up trying to balance work/life/creativity. Thank you, seriously, and on your comment – we need to be self absorbed for a while to get things on track and be free to absorb other things in life properly! Brittany continues the thought process here: http://brittanyvandeputte.blogspot.com/2010/02/muse-is-talking-again.html — good reading! Inspiring and so well expressed! I keep chasing my tail on this very topic, year after year. The problem, besides the multiple pulls from kids, self, work, husband, etc, is that the needs are always changing. So it’s a constant dance, and the changes make it feel chaotic. In hindsight, though, the constant change makes me realize the preciousness of each phase of my childrens lives and my life. I long for a “schedule”, not so much to quantify our time, but to reserve time for the “good stuff” and recognize its importance every day. Here’s a secret – I’m terrified of looking back on these years with regret about how we spend our days as a family, or how I develop my personal interests. I had just started “Steady Days” a few weeks ago, then got distracted by some other parenting books, then by our book club book – now I am excited to revisit SD and do some soul searching. I would love to see your binder! Thank you, Jane! I would loooove to show you my planner. I’ve been making tweaks for the past three weeks, but now I can’t imagine how I ever survived without it. This ultra-customized planner helps me manage all of the gazillion details of work life and domestics while ensuring that I keep my eye on the truly important things — the “big rocks” — and push myself to grow where I most need and want growth. My Sunday weekly planning time is a bit more intensive than some people might like, and the system might seem complicated, but I find that that time spent yields a HUGE return on investment. I no longer have that feeling of constantly trying to catch up or feeling side-lined by something unexpected (that I could have anticipated if I’d thought about it). Sure, there still aren’t enough hours in the day, but at least now I feel in control. And meanwhile, I’m building my family relationships in tangible ways. How cool is that? ?